I started blogging about 4 months ago all thanks to webmaster teacher. If she hadn't made it An assignment, I most likely would never have begun blogging! I blog only about YA books. Some of my absolute favorite genres are dystopian, sci-fi, fantasy, and historical fiction, but occasionally I read something else. 4. What is your favorite book(s)? Harry Potter. I am obsessed with it. It was because of the Harry Potter series I began reading. I also love the Unwind trilogy by Neal Shusterman. Becoming a feature! And meeting a whole bunch of fellow bloggers! Hey - for once an answer that won't reference Twilight or Harry Potter! I've had two late night reads in the past week. I've been lucky. Saturday night was consumed by Stolen Nights by Rebecca Maizel. Sunday night was taken up by The Duke and I by Julia Quinn - my first, but definitely not my last Julia Quinn book. Haven't read either of those, but I'll have to check them out. :D Great question this week! Awesome. What was Stolen nights about? Oooh I LOVE Julia Quinn! I totally understand why you stayed up for that one :) Happy Friday! Sorry, but I am not familiar with your choices either. However, if they kept you up late, then I'm assuming they must both be good reads. My friends have read Stolen Night, but still not totally convinced about reading it. My FF is scheduled to post @ 12am est, as it will officially be friday, lol! But I love the question! I'm currently reading Stolen Nights as well, and love it! Oh I love The Duke and I. My favorite is the 4th book about Collin. I bet you will love it as well. Yay for the Bridgerton series! My last one was actually a historical romance as well, but it was from The Rules of Scoundrels series by Sarah MacLean, One Good Earl Deserves a Lover. I recommend her books. They have a nice balance of whit and charm. I haven't read either book, but I am glad they were good enough to keep you up!! Happy reading! I still need to read Rebecca Maizel's books. Have had the first book for a while. I'm currently reading Stolen Nights and I totally agree with you, it's a real page turner! I haven't read The Duke and I but I will check it out! Thanks for hosting, Old follower. And YES for Stolen Nights, I LOVED this book so so much! I admit I never have read anything by Julia Quinn, but seeing you and Pushy so insanely in love .. there must be something about these books I need to read! Since the books kept you up reading them, I will definitely have to check them out! Nice ones! Haven't read those! I haven't read either of those books, but I'll check out your reviews for sure. Here's my my FF post for this week. Old follower wishing you a fantastic Friday. I been hearing great things about Rebecca Maizel. Will have to check it out. Hi, this is my first FF, and I'm a new follower. I haven't heard about either of your books, but I'll definitely check them out now! I'm unfamiliar with the books you chose but I'll be looking them up so thanks for sharing! I haven't read those books but I remember staying up late for the final Harry Potter! And yes Harry Potter. Always. Great answer, I can't wait to read these. Great answer. I haven't heard of these books but I'll definitely check them out! Hahaha I also commented on how I finally had a FFF answer not relating to HP or Twilight! Priceless :) Anyways, both new books for me but I'm off to check them out now. 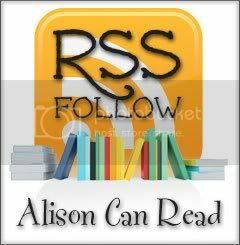 Thanks for sharing & hosting Alison! Finally I joined another Feature and Follow!! My last must read book is The Hunt by Andrew Fukuda. I haven't read any of those but it sounds like you had a great weekend reading them! I am not familiar with either of those books. Always great to find new ones people love! Wow two in the last week that's lucky. I've not read Stolen Nights and this is my first time hearing about Julia Quinn so I added a few of her books to my TBR list. oh good for you. I haven't read a book that made me want to stay up late to finish it lately, but have had two series that did that to me couple weeks ago. Haven't read either of those books :( .. But I will make it point to check them out..
New follower, check out my FF too.. I haven't read Stolen Nights yet, but I may need to check it out. I adore Julia Quinn and am so glad you enjoyed The Duke and I. I hope you continue with the Bridgerton books because it is one of my favorite series. Book 2-The Viscount Who Loved is my personal favorite, but they are all good. Old follower. Oh my gosh, The Duke and I is one of my favorite Julia Quinn books. I love her Bridgerton series (the Duke and I is the first). Definitely don't miss Romancing Mr. Bridgerton! Oh and The Viscount Who Loved Me. But the one I re-read the most is How to Marry a Marquis. It is one of her earlier ones, but I just can't resist Elizabeth and James in this book. I'm looking forward to reading Stolen Nights, although I'll have to reread Infinite Days first since it has been so long. I haven't read either of those books but I love books you can't put down. Late night reading is usual for me anyway, after the kids have gone to bed.